NEW Traxxas T-Maxx 3.3: longer wheelbase, new specs! “The Biggest, Meanest T-Maxx Ever!” says Traxxas. “The new T-Maxx stands tall and reigns supreme as the King of Monsters with its new giant 6.3” tall tires, and new long wheelbase chassis. 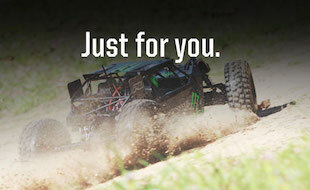 It’s built Traxxas Tough for big fun over impossible terrain. The TRX 3.3 Racing Engine is even more wicked on the power stroke with the new high-volume air filter and Resonator aluminum tuned pipe.” That’s the short scoop; for more pics and the official Traxxas info, click over to the Hot News & New Stuff forum.